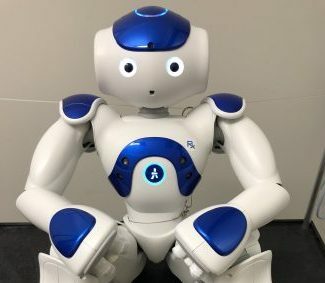 After a public contest, the newest member of the Red Deer Victim Services team, who also happens to be a robot, finally has a name – Ard-E. The winning name was submitted by Laney, age 6. In addition to a prize pack, Laney will be invited back to the detachment and will be made honourary “Police Chief for the Day”. Ard-E, purchased by Red Deer Victim Services through donations, can now get to work helping and supporting children through police and court proceedings. By singing, dancing and playing games, Ard-E interacts with children in a way that adults can’t. This helps put children at ease during difficult and stressful situations, like giving statements or preparing for court. The contest to name the robot was launched on January 7, and was open to children ages 5-14. Over 200 submissions were received and the final winner was selected by public vote after the submissions were narrowed down to the top three. The runners up included Astro and Charlie. Red Deer RCMP and Victim Services thank every who entered the contest.